Polka dots & a pop of pink for the last summery weekend in Chicago. This weekend’s weather was just beautiful and the 90 degree temps definitely called for shorts – my favorite shorts of the summer, actually. I really need to find another pair of these shorts at a ZARA store because they sold out online. When I find the right fit, I tend to buy the same item and it’s totally worth it. I also found this polka dot ruffle top at ZARA (on sale) and had to have it. It’s so cute and fun 🙂 Plus, I figured I could layer it when it gets colder. To add a little flare and color, I wore my pink metallic loafers and my companion mini – my two other summer favorites. 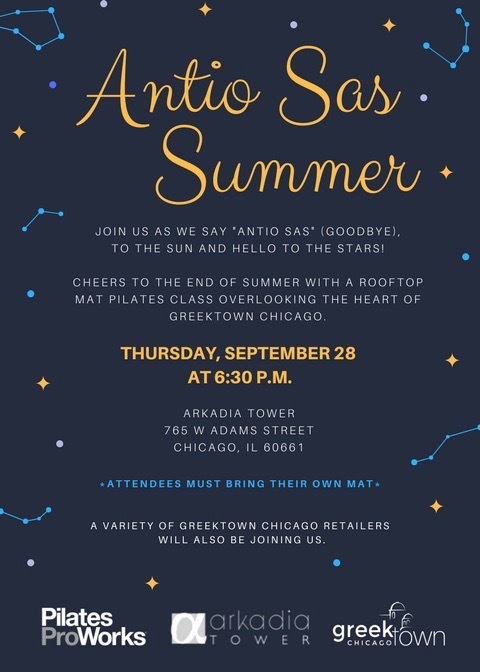 On another note, there’s a free pilates class on the rooftop of the Arkadia Tower this Thursday night to welcome in fall. See the invitation below and register here. I hope you can all join me. Have a wonderful last week of September.